Ever since I saw this pin I have loved the colour combination of marigold and pink. I think a complete kitchen reno is a little far into the future for us so I had to make do with these drawers we got for the girls room. We were living in our house for about a week before our stuff arrived and I was itching to turn our hose into a home so this is one of the things I did in the evenings after the girls went to school. I got two sample tubs of Taubmans paint from Bunnings and it was way more than I needed for the project. There are six drawer fronts for the two units. I ummed and ahhed about how to arrange the drawers and knew that Lu would definitely want lots of pink so settled on a 121 and 212 arrangement. Apparentely Lu's favourite colour is pink and Smalls' is orange. Who knew? I'm not sure what came first, the favourite colour or the chest of drawers. I did two coats on each drawer front and it really needed the second one. 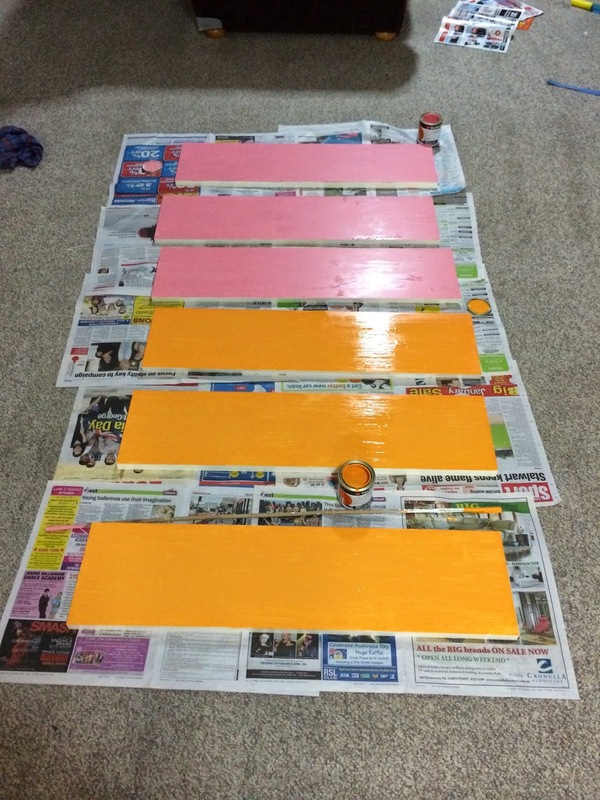 I didn't worry about priming or sanding and the paint has been fine so far. (Five months on) It didn't take long to paint them and we had plenty of free floor space to let them dry. The colours in real life are a little less Malibu Barbie then they look here. We've also put in new curtains, new carpet and a new rod to hold the dresses. ALL THE DRESSES. It's really nice having all the little dresses on display like that. It means Lu usually has a few wardrobe changes in the day and is seldom without one of her beauties on but it is another little bit of colour in the room. We also put the shoes lined up (ha ha) under the dresses. This provides great amusement for Smalls and lots of fun when it's time to put our shoes on and head out the door. 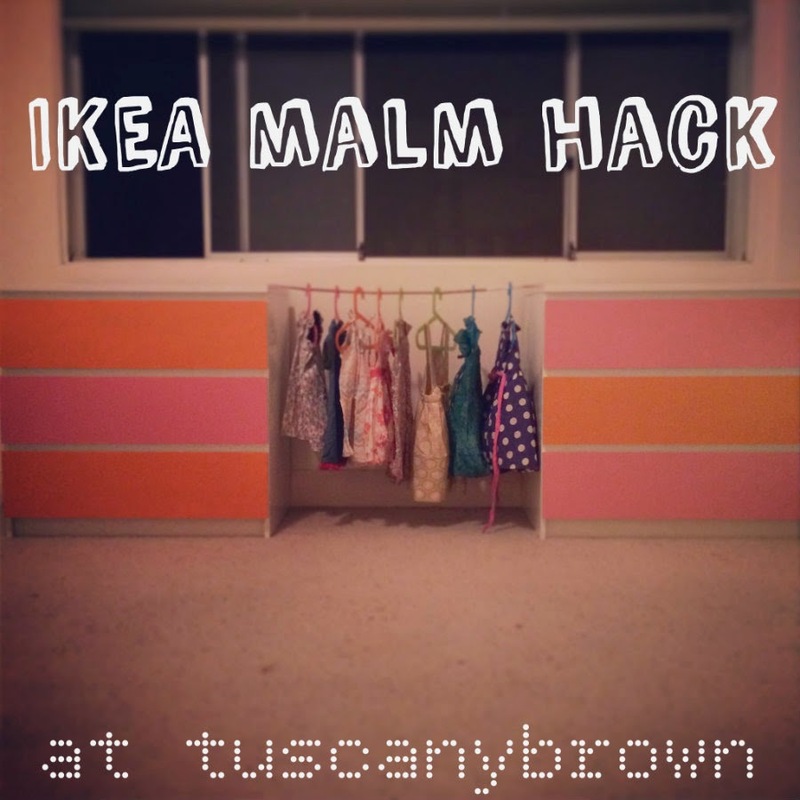 Do you have Malm dressers? Have you painted them or done something special? I'd love to see. How do you store beautiful little dresses? Stay tuned for what the girls room looks like now. Once I've done the laundry and tidied the place I'll take some snaps.